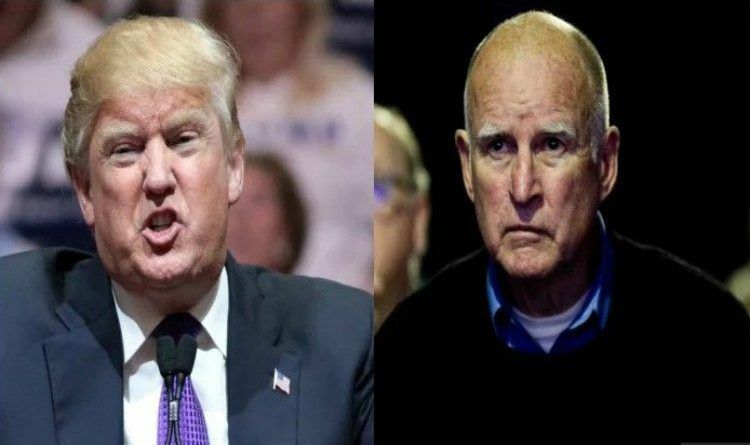 On Saturday, President Donald Trump called out California Gov. Jerry Brown (D) over his latest decision to pardon five immigrants who face possible deportation. Brown signed “sanctuary state” legislation last October in a rebuke of Trump’s increased immigration restrictions. Trump has repeatedly blasted the state as hosting immigrants in the country illegally who commit crimes, a charge he repeated on Saturday. Those pardoned Friday included Sokha Chhan and Phann Pheach, both of whom face deportation to Cambodia, a country ruled in the 1970s by the genocidal Khmer Rouge. Chhan was convicted of two counts of misdemeanor domestic violence in 2002 and served 364 days in jail. Pheach was convicted of possessing drugs and obstructing a police officer in 2005 and served six months in jail. The pardons were among 56 the Democratic governor announced Friday, along with 14 commutations. This is scary! He pardons criminals, supports them and invites them to our state. Why isn’t Gov. Jerry Brown being arrested for going against the Federal government? Are we or are we not a country of laws? How many laws does he have to break and for how long before the authorities do something? Nothing says he cares about the safety and security of Californians like pardoning a drug dealer, a kidnapper, a robber, and a wife beater. Way to go Governor! I hope you are voted out soon. BOYCOTT! Hold the Advertisers of The View ACCOUNTABLE For The Attack on Judge Jeanine – Call The Now!